There are 34 Assisted Living Facilities in the Prior Lake area, with 2 in Prior Lake and 32 nearby. To help you with your search, browse the 120 reviews below for assisted living facilities in Prior Lake. On average, consumers rate assisted living in Prior Lake 3.8 out of 5 stars. Better rated regions include Shakopee with an average rating of 4.5 out of 5 stars. Caring.com has helped thousands of families find high-quality senior care. To speak with one of our Family Advisors about assisted living options and costs in Prior Lake, call (855) 863-8283. Prior Lake is a developing suburb of Minneapolis and St. Paul with a small-town feel. The Prior Lake area has 57 Assisted Living Facilities (ALFs), with two in town and another 55 located nearby. 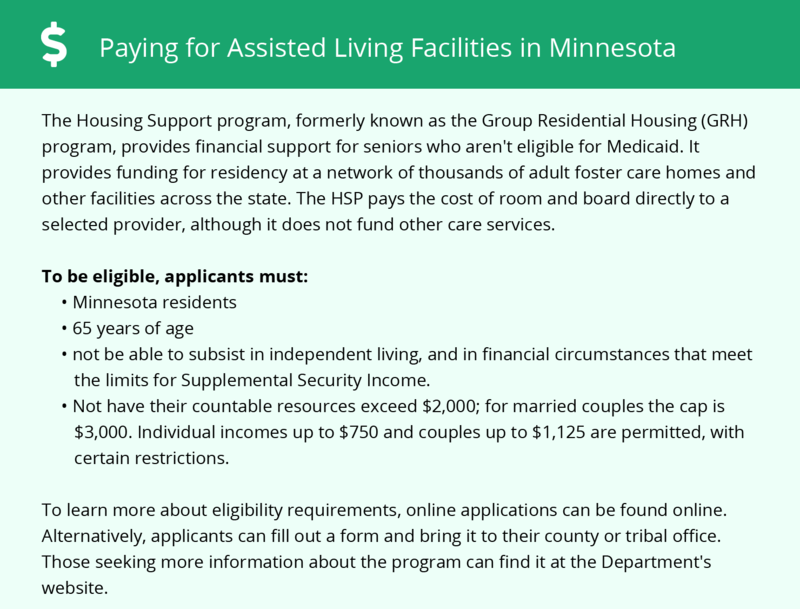 The licensing and regulation of these facilities, also known as housing services in Minnesota, is handled by the Minnesota Department of Health (MDH). Scott County received an excellent A rating for its air quality from the American Lung Association. This could be a major benefit for seniors living with a respiratory illness or bronchial condition. Seniors on a tight budget may find that living in Prior Lake is a strain on their finances. The cost of living in Prior Lake is 24.9 percent higher than the national average, making it more expensive than the majority of the state. The cold, snowy winters in Prior Lake could be a drawback for many seniors. January temperatures fall to an average low of 6 degrees, and the city receives 49 inches of annual snowfall, nearly double the U. S. average. The Prior Lake area is home to world-class medical facilities, including Fairview Ridges Hospital, in the event of medical emergencies or illness. The Metro Transit connects the public throughout the Minneapolis/St. Paul area. The express bus route goes into nearby Shakopee and has a stop in Downtown Prior Lake. Seniors can ride at a discounted rate with proof of age or disability. Seniors and their loved ones may appreciate the low crime rate in Prior Lake. Violent crime at 22.9 out of 100 is lower than the U. S. average of 31.1 (1 being safest). Property crime is lower as well at 26.1 to 38.1. Assisted Living costs in Prior Lake start around $0 per month on average, while the nationwide average cost of assisted living is $4,000 per month, according to the latest figures from Genworth’s Cost of Care Survey. It’s important to note that assisted living rates in Prior Lake and the surrounding suburbs can vary widely based on factors such as location, the level of care needed, apartment size and the types of amenities offered at each community. 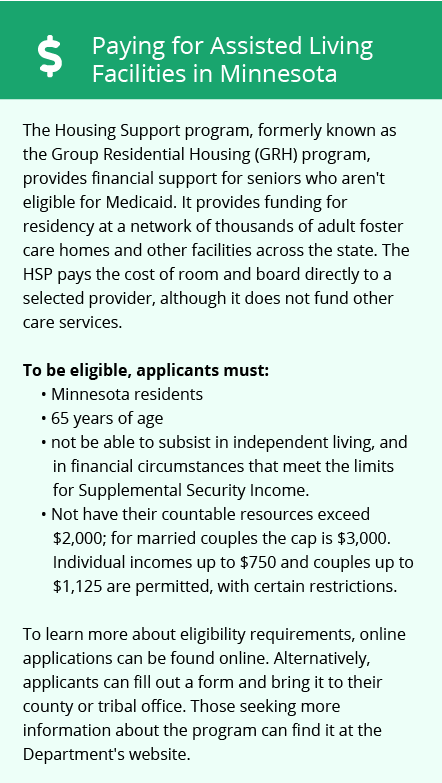 Seniors who need help covering the costs of assisted living in Minnesota have several options. The state offers a few non-Medicaid programs such as the Consumer Support Grant (CSG). Seniors who have Medical Assistance (MA), the state's Medicaid program, may be eligible for assisted living coverage and additional Medicaid waivers. To see a list of free assisted living resources in Prior Lake, please visit our Assisted Living in Minnesota page. Prior Lake-area assisted living communities must adhere to the comprehensive set of state laws and regulations that all assisted living communities in Minnesota are required to follow. Visit our Assisted Living in Minnesota page for more information about these laws.